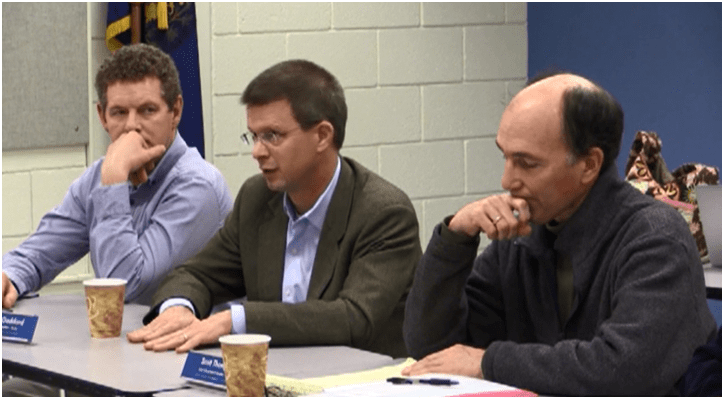 At their March meeting, U-32’s school board discussed proposed cuts to science labs, finalized the hiring of U-32’s next Assistant Principal, and held a discussion with three state representatives about the potential impacts of Act 46, and the proposed legalization of marijuana in Vermont. Early in the meeting, Kari Bradley, board member from East Montpelier, shared a concern from a parent about the proposed elimination of separate lab bands for science classes. U-32’s principal, Steven Dellinger-Pate, explained that labs currently meet one or two times per week beyond the regular class time. He said labs would not be cut from upper-level science electives but there would no longer be separate, additional class meetings for labs in freshman or sophomore science courses. The change would go into effect the year after next, he said. “On the face it sounds like we just won’t be doing labs, but that’s not true; that’s not what’s going to happen,” said Dellinger-Pate. “I understand that, but the other concern is that it will be less science time,” Bradley said. Dellinger-Pate said the change would bring U-32 in line with the time given to science in other schools around the state, and that the labs currently require a slot in students’ schedules which could now be open for music, art, electives, even an additional science class. Michelle McFadden, a parent in attendance, referred to the school’s NECAP test scores in science and questioned taking time from science in an area where students are not demonstrating proficiency. Dellinger-Pate defended the decision as an acceptable tradeoff. After routine reports from board subcommittees, the board conducted a brief interview, over Skype, with William Deiss, finalist for the assistant principal position at U-32. Deiss is currently dean of students at East Mecklenburg High School, a diverse public school of over 1,800 students in Charlotte, North Carolina. Dellinger-Pate said the hiring committee had been particularly impressed by Deiss’ work building a program, called “Eagle Flight,” involving families in weekend tutoring programs and other supports to help eighth-graders transitioning to high school. Board member Jonathan Goddard asked Deiss about his philosophy of student discipline. He told a story about a student who had been brought to his office that day, for swearing at a teacher and insubordination. It turned out the student was having a problem with his girlfriend. “‘You need to keep the girlfriend emotions over here, and when you step through the classroom door you can’t displace that anger,’” Deiss said to the student. “We’re in the business of relationships,” Deiss said. After the interview, Superintendent Kimball recommended the Board vote to hire Deiss for a two-year contract. The motion carried unanimously. Speaker of the House Shap Smith, center, discussed the proposed marijuana legalization bill with U-32’s school board. In the second hour of the meeting, the board held a discussion with three state representatives: Shap Smith and Avram Patt, both representing the district including Marshfield, Worcester, Woodbury and Elmore; and Ann Donahue, representative for Northfield and Berlin. They began by celebrating the passage of the school budget, and the high voter turnout on town meeting day, which the representatives attributed to the presidential primary. Board Chair Adrian Magida described the work of the Act 46 committee, which has been discussing the possibility of consolidating the five local school boards from U-32’s sending towns to a single, district-wide board. “People are more concerned about how this will affect students, and less about cost savings,” Magida said. Representative Avram Patt said while cost savings may take time to materialize, there was some potential for efficiency in the district. The last portion of the discussion turned to the debate over the pending bill to legalize marijuana in Vermont. Shap Smith, who represents Worcester and is also Speaker of the Vermont House of Representatives, said the existing system of prohibition is not working, but it is not clear whether the current bill would make a positive impact. Smith described a discussion he had recently had with a group of eighth- and ninth-graders, including his own son. Smith said he is a cautious advocate for legalization. U-32’s Assistant Principal, Jody Emerson, raised concerns about the misinformation she’s seen among U-32’s students. Emerson also described challenges arising from the new forms marijuana has taken in recent years. “How do we keep kids safe when it’s in the edibles, especially some of the stuff that is really high strength that kids might get ahold of and not understand the impact of what it could do to them?” she asked. Editor’s note: This article was an assignment for a journalism course I’m taking through Harvard’s Extension School. The piece is longer, with more quotes, than a traditional Associated Press- style article about a meeting– I lost points for focusing on discussion as opposed to concrete outcomes from the meeting. The traditional approach would be to focus on the one major decision by the board– hiring our new assistant principal– but I thought the other discussions were interesting.